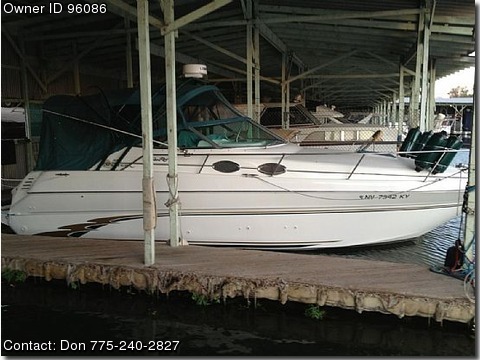 Contact the owner Don @ 775-240-2827 with any questions.This is a 1998 Sea Ray 270 Sundancer, it is loaded! ONLY 294HRS, Overall length 29' 10" with swim platform Beam 9' 2" 7.4 Liter / Bravo III Outdrive -- 310 HP -- Fuel injection out drive replaced 3 years ago! 100 gallon gas tank / 28 gallon fresh water tank 19" flat screen tv 4000 watt generator Central heating & air conditioning Transom shower New Battery charger New batterries as of 8-2012 Brand New Lowrance color GPS/Fish finder/radar all in one HDS10 VHF radio Custom made radar arch w/rod holders powdered coated green Full camper canvas or delta canvas like new! new snap in carpet on the deck! Refrigerator Water heater Dual counter rotation props New Windlass Kitchen sink, microwave, fridge, 1 burner stove Sleeps 6 Also has a tandem axle trailer! that is included in sale price! THIS IS A MUST SEE BOAT!! !